Lost Lake is located on the north side of Mt. Hood, this is a place of slow morning walks, watching sunsets, counting stars and discovering a special part of both yourself and nature's splendor all over again. Lost Lake offers great fishing, hiking, bike trails, or plenty of reasons to do nothing at all. Lost Lake Resort has seven rustic cabins with electric lighting, cooking facilities, wood stoves, and rustic furniture. There is no plumbing in the cabins. All lodge rooms have kitchenettes, bathrooms, and double size futons. RV and tent sites are available on a first come, first serve basis. Lost Lake is home to 120 camp sites but only take reservations for cabins & lodge rentals. Lost Lake Resort & Campground is normally open Early May to Late October. Weather Permitting. Lost lake's Resort is situated on the shores of Lost Lake, 3,100 feet up the slopes of Mt. Hood. A dormant volcano whose loftiest areas are home to eleven glaciers, Mt. 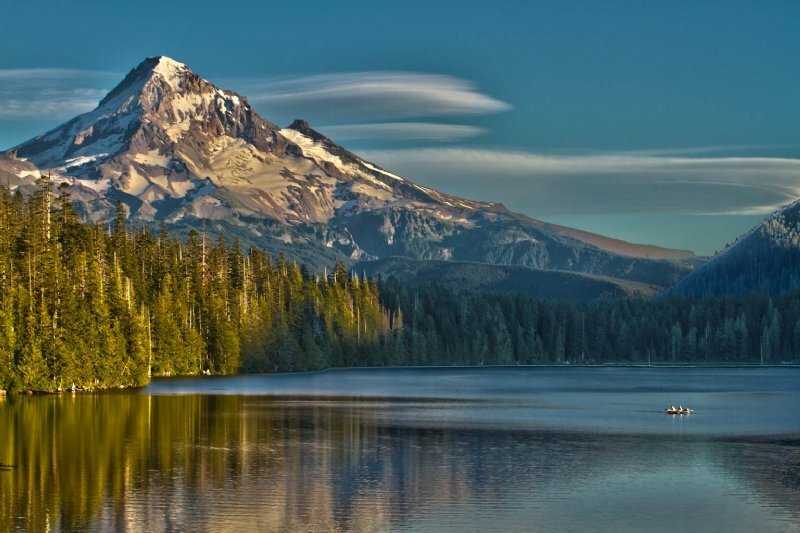 Hood is Oregonâ€™s highest peak at 11,245 feet. Nestled into this scenic splendor, the Resort offers a general store, located in the new Lodge. One day only fishing licenses, gift shop items as well as ice and your favorite beverages are available. Lost Lake starts fishing well from the time it opens in late spring. This early season is a great time to catch some of the larger hold over fish or that elusive brown trout. When it first opens most of the fish are found through out the lakes shallower water (5â€™ to 15â€™). Best fly fishing techniques would be fishing streamers like brown or black size 8 or 10 wooly buggers and leach patterns on a slow sinking line. You will also get some mayfly hatches once in a while that can give you some good top water action; this gets better as you get into summer. Best mayfly top water patterns would be: Parachute Adams #14, Tilt Wing Callibaetis #14 or #16 and a Callibaetis Cripple #14. We put together this "Go To" selection of Flies for the High Elevation Lakes in our Oregon / Washington Cascade region but these flies will catch fish no mattter where you are...Don't leave home without them! It says "Rustic Cabins", these cabins are probably older than you. No flush toilets unless you have a lodge room. It cost's $7.00 per vehicle to enter the park. Water is pumped out of the lake and filtered. Shower tokens cost $4.00. You can not reserve tent or R.V sites: first come, first serve. If your planning on staying over night. | Get there early! Don't forget to check out the view of Mt. Hood! Keep in mind Lost Lake is about a 45 minute drive from Hood River, so grab some extra flies, maybe a corn dog or two and your favorite beverage because 144 turns on Lost Lake Rd. alone, you may need it.